A team of weapons inspectors will return to Damascus on Wednesday following Syria's pledge to give up its chemical arsenal. The last time they were in the country they were shot at as they tried to gather evidence. What does it take to be a weapons inspector? Last month, Ake Sellstrom and his team of 20 weapons inspectors negotiated a ceasefire between the warring parties in Damascus and set off for Mou'adamiya, in the suburb of Ghouta, to check whether reports of a chemical weapon attack were true. But no sooner had they entered No Man's Land when the shooting began. "We had quite a few sniper shots in the windows - the windows of the armoured vehicle almost collapsed," he says. "We were warned by security people working with us that this normally happens, that snipers could put a bullet here and there just to mark that this is their area - they are in power." Sellstrom's team changed into another armoured vehicle and eventually arrived at the site to gather evidence. The episode illustrates the kind of determined mindset that Tim Trevan, a former UN weapons inspector in Iraq, says is one of the main requirements for the job. "On 26 August we went to the Syrian town of Mou'adamiya, in Western Ghouta, having negotiated a five-hour ceasefire with the government and the opposition. It had been completely isolated for nine months and as our cars drove in, crowds gathered round to sing songs and bless us. 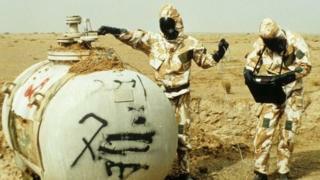 "Before we went to the sites where chemical weapons had been used, the team put on their masks, suits, gloves and boots to protect them from toxic substances. The temperature was over 40C and they had to wear all this protective gear as well as bullet-proof clothing and helmets, so it was tough for them to work. "Under stress a team could crack and go different ways but we became an even tighter team. It was quite an emotional experience and as head of the mission I was tired for some time afterwards." "You want people who... are very persistent. You definitely want a sort of terrier - the type of dog who won't let go of the bone," he says. In Saddam Hussein's Iraq, officials would sometimes tell Trevan and his fellow inspectors blatant lies. "What they were supposed to give us were called full, final and complete declarations, and on occasion we used to joke that what they were giving us were full, final and complete fairy tales," he says. On one occasion a team of UN inspectors in Iraq had to camp outside the Ministry of Agriculture for three weeks before they were allowed into the building. By then the documents they wanted to see had been spirited away, but the inspectors could see that furniture and filing cabinets had been moved, which gave further weight to their suspicions. But a stubborn refusal to be hoodwinked, and an insistence on gaining access to the necessary sites, is only the beginning. When inspectors are dealing with a country at war they need on their team a wide range of abilities, some of which have nothing to do with weapons of mass destruction. Trevan reels off a long list of experts he would want on his team - a civil engineer to check whether the buildings he is entering are structurally safe, an explosive ordnance expert who can check for unexploded bombs and mines, as well as people who can look after his personal security. Only once security is taken care of can you get down to the nitty-gritty of site inspection. If inspectors are investigating a site where a chemical attack is thought to have taken place, samples need to be collected from bodies, the soil and the water supply. The evidence then needs to be meticulously recorded and stored to make sure its reliability cannot be questioned. Medical experts are required to record precise information from local doctors who have treated injured people. Knowledge of the effects of substances and how they are broken down in the body is crucial at this stage. When an inspection team is investigating an entire chemical weapons programme, there will also be a chemical engineer and an industrial chemist who understand how to turn chemicals into weapons. They may also have to determine the real purpose of an industrial facility - whether it has been designed to produce large quantities of chemicals for a weapons programme. Then you need someone who can identify the weapons used to deliver the chemicals, be they artillery shells, rockets, missile warheads or bombs. But that's still not all. In Iraq, Trevan was faced with a game of what he calls "cheat and retreat". "Iraqis made a declaration we didn't believe so we had to come up with evidence to prove that they were wrong and then they would give us a new story," he says. In situations like this where trust is lost, Trevan says you need to study documents dating back decades. This requires a further set of skills. "You need people who are experts in export documentation so that you can find the companies who were the suppliers and ask them what the country imported," he says. When following the paper trail, it also helps to know whether a document supposedly from the 1970s really is 40 years old, or something knocked up yesterday. This is where forensic experts come into play. "You have got to be able to ascertain whether the paper is of the age it's supposed to be and whether the ink is of the age it's supposed to be," says Trevan. Investigators will usually conduct numerous interviews, so an inspection team would also need reliable translators along with people skilled in interrogation techniques and the psychology of body language. For Trevan the small details can be the keys to the truth. In Iraq they would ask lots of questions about dates, colleagues and even the colour of the paint on the lab walls. "Very silly little details like that can get you to a stage where... you can prove that they are trying to tell a lie," he says. When he looks at the impact the inspections had on himself and his colleagues, Tim Trevan says their work was not as traumatic as that done by military personnel. But everyone was different afterwards, he says. "It does change things, yes. There is a psychological price." Ake Sellstrom agrees and worries about the impact it may have on him as a husband and father. "I use both my brain and my heart in my professional work but I think the danger is that you are exposed to situations that make you hard". But he thinks the risks he took in Syria last time were worth it. "Before this we just had indicators that wouldn't stand scrutiny," he says. "We now have evidence that could stand in court, evidence that chemical weapons were used in Syria." Ake Sellstrom and Tim Trevan spoke to Newsday on the BBC World Service.